In the proprietary TVRC technology MSW processing occurs in a high temperature (over 850°C) reactor/boiler via a reciprocating grate system. This reactor/boiler consists of high alloy steel casing grates (thus air cooling is sufficient) and is lined with high-grade refractory/insulation materials. Each (two modular units assumed in this example) high temperature reactor/boiler is capable of producing approximately 84 tons/hour of steam (450°C) at 3.82 MPa with a gross calorific value of the MSW assumed at 2,400 kcal/kg. This indicates that the 500 TPD assumed in this example would be converted into over 13 MW of electricity. The plasma-arc plasma gasification PTDR system would also produce approximately 5,000 metric tons per year of vitrified matrix through the processing of fly ash. Any bottom ash generated (estimated at 20% of quantity processed in the high temperature reactor/boiler) would be collected and provided and/or sold as cement aggregate. A basic, illustrative mass/energy balance can be seen below . 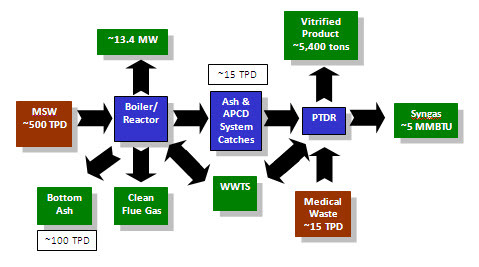 The below assumes that the excess plasma-arc plasma gasification PTDR system capacity is utilized to treat medical waste.